Using a weighing machine can be a useful tool to help adults control their weight, but for adolescents and young adults this behavior may have negative psychological outcomes. Researchers from the University of Minnesota recently tracked the self-weighing behaviors of more than 1,900 young adults as part of Project EAT (Eating and Activity in Teens and Young Adults) and found increases in self-weighing to be significantly related to increases in weight concern and depression and decreases in body satisfaction and self-esteem among females. According to the Centers for Disease Control and Prevention (CDC), more than one third of adults in the US are obese, totaling 78.6 million people. Among children and adolescents between the ages of 2-19, this figure totals around 12.7 million. The researchers’ primary interest in this investigation was to understand how changes in self-weighing were related to changes in the other variables studied. Results indicated that females who reported increases in self-weighing over the 10-year period were expected to have increases in weight concern and depressive symptoms and decrease in body satisfaction and self-esteem. As such, self-weighing may not be an innocuous behavior and care should be taken when young adults report self-weighing. For years, teenagers and women have spent and still spend a large portion of their lives focussing on how much they weigh. If they don’t weigh what they want their days are spent feeling bad about themselves to varying degrees. Then, they either spend their time trying to put in place behaviors that they think will help them achieve that weight, or feeling defeated and depressed about their ability to do “what’s needed” to lose weight. So, from both a physical and mental health standpoint, the focus on the number on the scale can significantly interfere in your daily routine. For so many of us the scale is a source of stress and self-loathing, but it really shouldn’t be. Don’t think of the scale as anything other than a compass — something we use when losing weight to keep us going in the right direction. Body weight varies throughout the day. Not only does your weight change every day, it also changes at different times through a single day, so there is no point to weighing yourself every day — and definitely not multiple times a day.This is because of body fluid fluctuations –— you might be retaining water from too much sodium consumption, clothes worn etc. 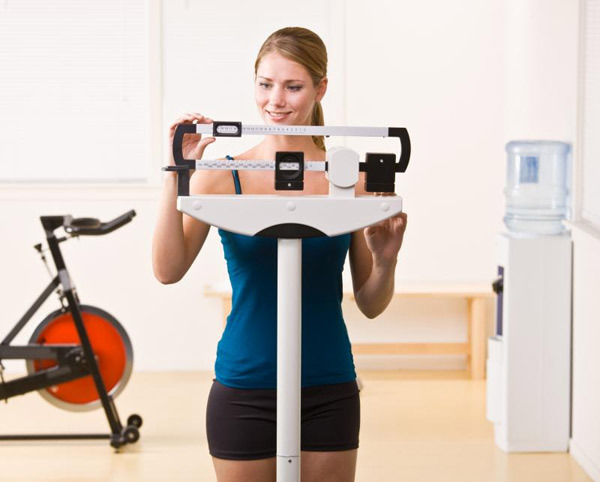 Weigh yourself just once a week to get a more accurate reading and let the scale actually show weight loss. The number on the scale will help you figure out if you need to make adjustments to what you’re eating or how you’re exercising. Keep in mind that half a pound to two pounds is a realistic weight loss so don’t expect results like the Biggest Loser contestants. Don’t jump on the scale after a big night out. You’re just torturing yourself. Rich, decadent restaurant cuisine is full of salt, fat, and sugar — things that make the meal taste so good! Keep in mind that it’s virtually impossible to gain weight after one large meal. If you get on the scale and see your number go up, it’s simply because your blood volume level has increased due to the large quantity of food that you’ve eaten. The high sodium content in certain prepared foods also causes the body to retain fluid, thus causing a higher number on the scale. Find other Better Options to track your Weight (Body Fat): There are several ways to find out your body fat percentage. Unfortunately, the more accurate the method, the more of a hassle and/or expensive it tends to be. DEXA scan – full body X-ray scan of the same type used for bone density. Very accurate. Hydrostatic Weighing – Weighing under water (completely submerged, with all air blown out of lungs) – Very accurate when done professionally. Skin-fold calipers (“pinch test”) – Simple, but needs to be done by someone who is trained, and you can’t do it on yourself. Wide variations in accuracy for people without training. Bioelectrical Impedance (BIA) – These are scales and hand-held devises that run low-level (and painless) electrical current through you. They can be accurate, although the accuracy varies according to the specific device and how it is used. Best results are obtained first thing in the morning with no alcohol consumed for 2 days prior, and no exercise the night before. According to the National Weight Control Registry, 75 percent of individuals who have managed to successfully lose weight and keep it off consistently weigh themselves. In addition, a 2012 study in the Journal of Nutrition and Dietetics concludes that people who lose weight are less likely to regain it if they weigh themselves on a regular basis. Become media savvy and educate yourself about the hidden powers of advertisement. Advertisers spend tons of money on strategies especially designed to make you feel there is something wrong with you, thus making you feel deficient by comparison. Never forget that how you look is only one part of who you are. Develop a sense of identity based on all the many things you can do, the values you believe in, and the person you are deep inside.